Planning to have a house party—just not in your own? There's no need to go around hunting for venues, guys. We've done all that hard work and found these awesome properties that you can book. Also, if you want a pool to be a star element of your party, give one of these properties a try. Disclaimer: While we're all for parties that go from calm to cray in no time, make sure you don't rise to level rowdy. As long as you leave the place in the condition you found it in, you're good to go. This gorgeous property in Manesar has a pool, a gazebo, four rooms, a bar counter, a courtyard and parking space for around 4-5 cars. You're more than welcome to BYOB and have a great party that goes all night (as long as you're not playing music loud enough to bother the neighbours). Click here or check out their Facebook to know more about the place. This Dwarka farmhouse is perfect to host parties when your gathering is small and it's secluded enough that no intrusive neighbours will come to tell you to bring down the music volume when it's late. There are five bedrooms, a huge lawn and a big drawing room. You can read more about this place here. This property in Golf Course Road has a pretty, all-green terrace, three bedrooms and comes with no restrictions on playing music all night. 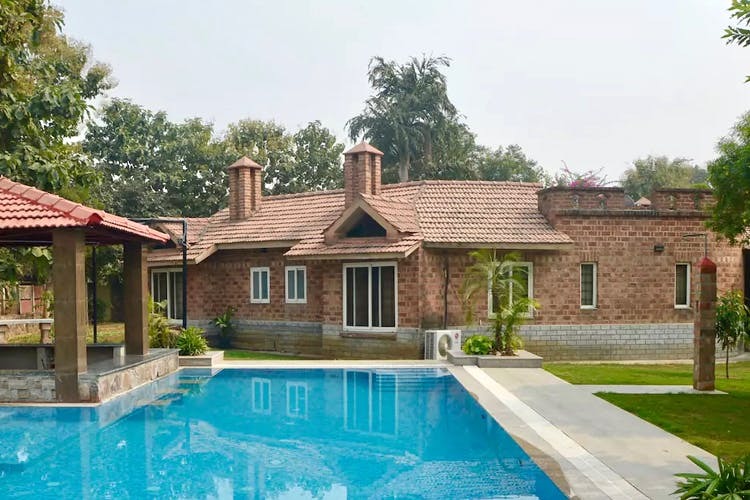 Located in Gurgaon, this huge farm villa has a pool and a poker table, a patio overlooking the lawn and a pool area that looks pretty darn inviting. The decor of the place is fancy and elegant, and it's perfect to host a party of around 60-70 people. The farmhouse has a beautiful courtyard, a pool and immaculately-kept gardens. It's better suited for low-key get-togethers with a group of max 15 people (you can't play loud music past 10pm either). Read more about this place here. You can make your bookings here.